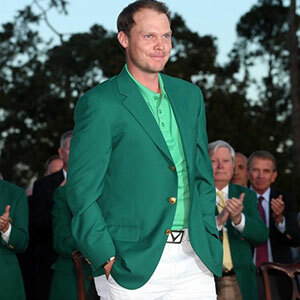 To say Danny Willett’s Green Jacket materialised suddenly would be an understatement. When Jordan Spieth reached the turn he commanded a five-shot lead. Then he went bogey, bogey, treble, while Willett birdied both the 13th and 14th. A seven-shot swing had taken place. On a course that was brutally difficult all week, Sheffield’s finest made only nine bogeys and nothing worse. On Sunday, there were five birdies and no dropped shots. Before anyone really knew it, this was Willett’s Green Jacket. There were more than shades of the only other Englishman to win the Masters, Nick Faldo, exactly 20 years ago. Then Faldo entered the final round six shots behind the leader, Greg Norman, and posted a 67 to win by five. Willett was three back at the start of play. He finished three shots ahead of Spieth and his playing partner Lee Westwood. But this was not supposed to be where the challenge came from. The only players realistically capable of catching Spieth were thought to be Jason Day and perhaps Dustin Johnson and Hideki Matsuyama. Westwood if you were being optimistic. Rory McIlroy if anyone could mount a traditional Augusta charge. But a 28-year-old from South Yorkshire, the last man to register this week because he was spending as long as possible at home beforehand with his newborn son, Zachary, and wife Nicole? Hardly. The last round fell on both his wife’s 28th birthday and Zachary’s due date. As it happened, his firstborn was delivered by planned C-section a week early. With only one previous Masters to his name, a creditable if unremarkable tie for 41st, there was little in the way of course form to go on. This was not, though, the first time the Yorkshireman had experienced the top end of a Major leaderboard. At the halfway point of last year’s Open at St Andrews, Willett led the field. He never quite looked comfortable though and a drive out of bounds at the 14th in the third round took him out of the spotlight. To his credit, he finished the week strongly to come in 6th, easily the best Major finish of his career at the time. There is no doubt, with the benefit of hindsight, that last season was the making of him. There were two wins on the European Tour, in the Nedbank and the European Masters. That established him in the all-important world top 50. In February, he claimed the biggest prize of his career to date at the Dubai Desert Classic. Perhaps even more significant was a third place at Doral in the WGC last month. Willed has never lacked for confidence but without a PGA Tour win to his name, this was the next best thing. Validation that he belonged at the top table. It took him to the brink of the world top 10, 12th to be precise, but barely acknowledged as a Major contender, especially in America. That has all changed now. Willett’s Green Jacket has its roots at Rotherham Golf Club, known locally as Thrybergh, where he has been a member since his junior days. As an amateur, he leapt to prominence in 2007 by winning that year’s Yorkshire Amateur and propelling himself from nowhere to that September’s storied Walker Cup at Royal County Down. He becomes the third man playing that week to win a Major championship, after Rory McIlroy and Webb Simpson. Also in action in Northern Ireland were the likes of Rickie Fowler, Dustin Johnson and Billy Horschel, to name a few. This son of a vicar is hardly golfing royalty, far from it. He is not part of the so-called golden generation of Englishmen that includes Justin Rose, Paul Casey, Luke Donald and Ian Poulter. Now he is a member of one the most exclusive clubs in golf. He is the first European to win a Green Jacket this millennium (Jose Maria Olazabal was the last, in 1999). He will make his Ryder Cup debut in September. He is ranked inside the world top 10. Coupled with the birth of his son, Willett’s life has changed unrecognisably in the past fortnight. At least the former was expected. Out of the blue has come the Green Jacket.